Mommy and Zander are going up the mountain! This past Friday I had one of the funnest rides I’ve had in a while. I woke up early to sneak out the door before Zander was awake and get in a ride. Before I finished coffee, the little guy came stumbling out of his room. Since it was Friday, I knew that Brendan had a lot of prep to do for the shop. Thursday was busy and Friday would surely be, as well. My first thought; no ride for me. On second thought, I’ll just take him with me! I asked Zander if he wanted to go climb a mountain this morning. He said he wanted to go ride HIS bike with me and I explained that I’d be pulling him in the trailer for this one because it was a big mountain. He was on-board and ate his oatmeal so he could get energy for helping me up the mountain. I told Zander that there would be steep spots in the road and he would have to cheer me on to help me. We loaded up and got out by about 8. We rode through town and I could hear him singing in the trailer. 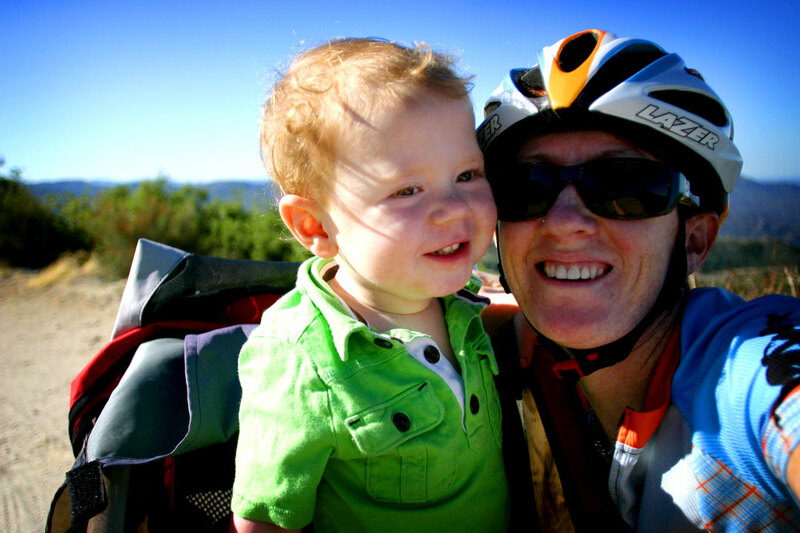 “Mommy and Zander are going up the mountain.” Even if I had to stop the ride here, it would have been perfect. We started climbing the control road towards Pine Cove and Zander said he wanted to go home. It was too bumpy. I was bummed, cause I really wanted to get in a ride. I asked him if he could hang in there so we could go up and see the lake. I also adjusted his blanket like a pillow and he agreed to continue on for a little bit. 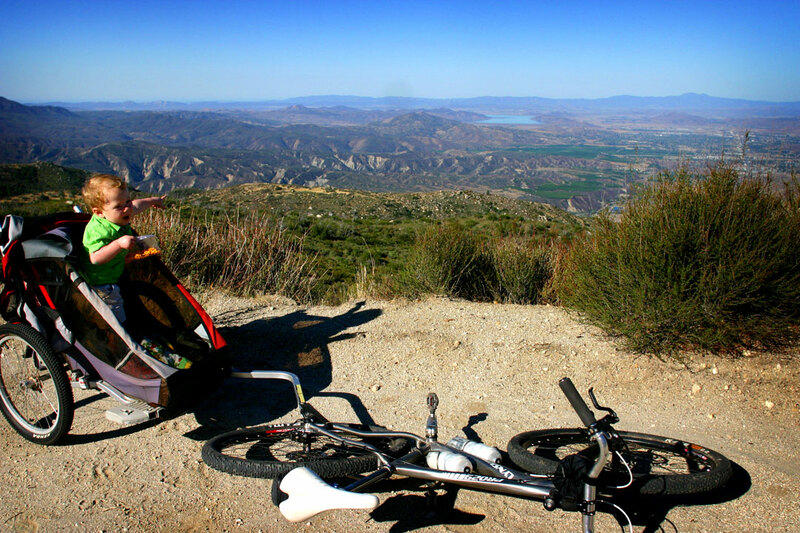 We got to a viewpoint in the road where he could see Diamond Valley Lake in Hemet. He stood up in the trailer and explained that he wanted to go fishing now. I told him that it was still a long ways away and we’d have to save that for another day. Ready to go back down, since that was the bargain, I asked him if he was ready. He said that he wanted to keep going up and “climbing the mountain.” That made my day. As we continued climbing, when we got to a steep pitch and I had to granny-gear it, Zander would help me get up by yelling “go! mommy! go!” I definitely had to make it without walking, then. Oh my gosh, what a ride it was going back down. We swooped the turns wide banking up on the sides and he had a blast and I could hear his laughter the whole way down. That’s my little guy. What a success. This was our first dirt ride in a long time and the longest and hardest I’d done with him. All together it was a couple hours and as soon as we hit pavement, he fell asleep. Good thing he got a workout, too! Awesome! There’s no question what sport this kid’s going to love. like a happy child full of curiosity. I love this sweet account of your day! You are such an inspiration! Go faster mommy – so awesome!! 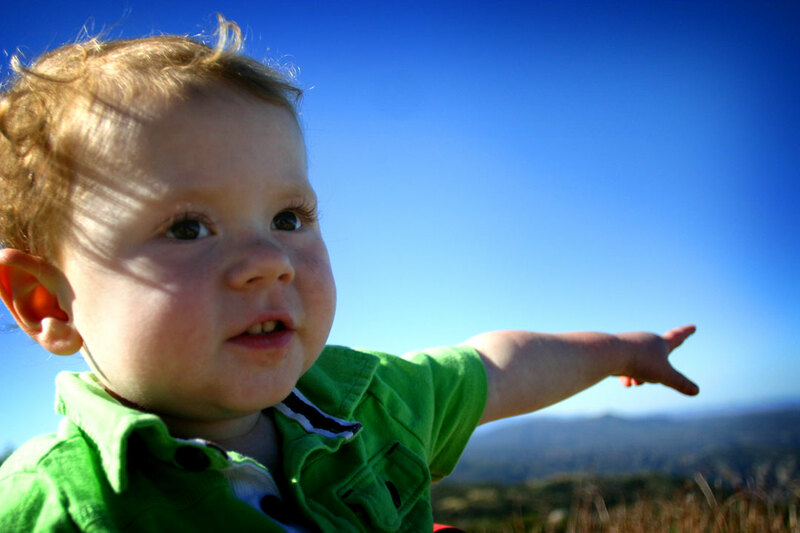 What an adventure for Zander and a precious gift for you. That story made my day. Thank you for sharing! Hey Mary, I looked you up after seeing the Ride the Divide movie on Netflix.. I just wanted to say thank you for finishing the race, because that really made the movie for me. You are really inspiring. Great story. 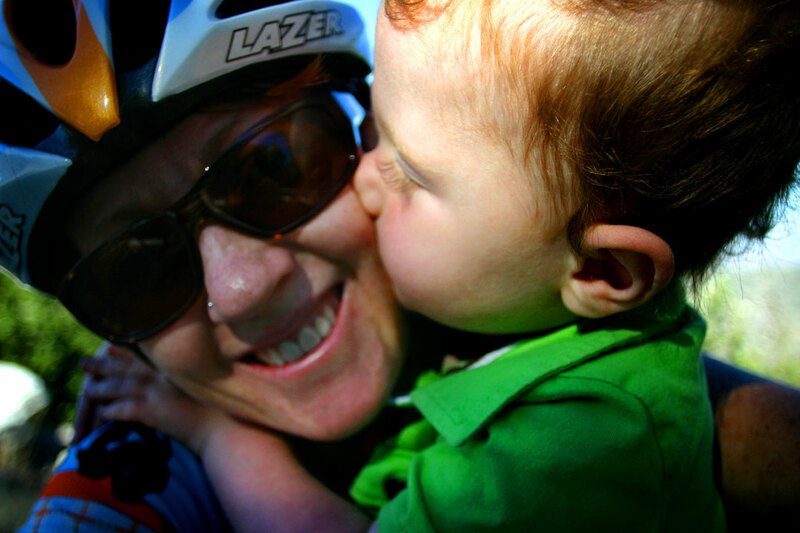 I’ve been riding my 18 month old grandson for the past few months, first on the back of an Xtracycle and, more recently, on a front-mounted Bobike seat. I’m not sure I’d have the guts to ride him on trails on the handlebars, but on the street he goes totally ape for it. The trailer looks like the safest spot for trail riding. Keep it up, he will thank you for finding a way to take him along. You should organize a “portage-a-kid” ride from the shop! Teddy and I will be there.